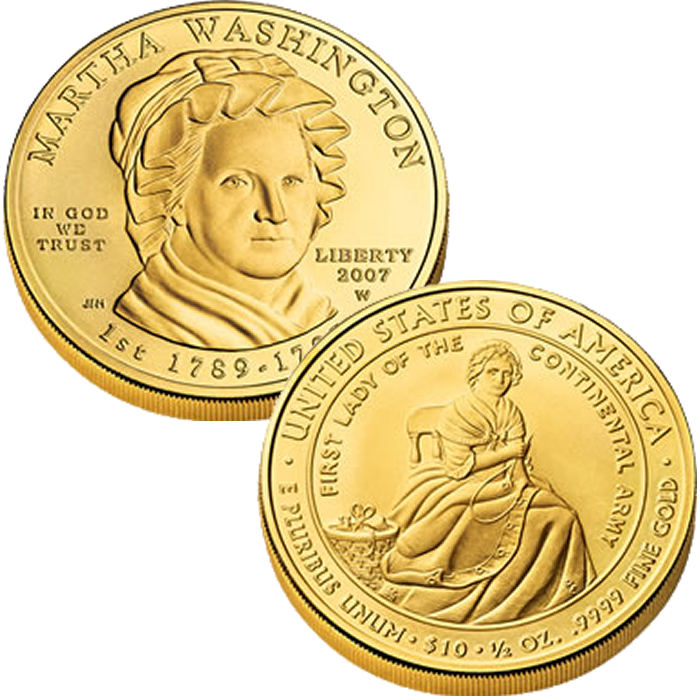 The 2007-W $10 Martha Washington First Spouse Gold Uncirculated Coin was the debut strike of a new series created to honor the spouses of the former Presidents of the United States. As Martha was the wife of the first President of the United States, George Washington, it was only fitting that her coin be the first to appear in the series. Subsequent coins were and are released in the order upon which the associated President served in office. The entire First Spouse Gold Coin series are struck from 1/2 ounce of 24-karat gold to either proof or uncirculated condition. The series calls for the coins to be released at an approximate rate of four per year. As indicated above with the Jefferson’s Liberty Coin, if a President served without a spouse, the mythical figure of Liberty will be used on the coin instead. Thomas Jefferson’s wife had passed away nineteen years before he took office. 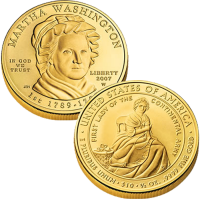 Initial price on the Martha Washington Uncirculated Coin was $410.95. A portrait of Martha Washington is found on the obverse (heads side) of the coin and was designed and sculpted by Joseph Menna. Susan Gamble designed the reverse (tails side) to show Mrs. Washington sewing a button on her husband’s coat. It was sculpted by Don Everhart.